Lately, I have fallen down when it comes to the number of MacroTourist posts. It’s not that I didn’t want to write, but I got Lennon’ed with life getting in the way of my plans. So to remedy this situation, I have decided to commit to posting today’s write up, but also a follow-up tomorrow. I figure that if I promise you two pieces, the shame of not following through will ensure compliance. Call it my own little life hack. Today’s piece will be the bear argument, with tomorrow’s post arguing the bull case. I will not bother giving you all the reasons why the market might go up or down, but rather, focus on subtler reasons the market might be missing. Call it my version of the market’s in-attentional blindness (which by the way, I never seem to miss the guy in the gorilla suit so I almost don’t believe this is a real thing). So on to it! The bear case. Investment grade debt is all corporate debt rated BBB or higher. If a debt security drops below this level, it is no longer investment grade and gets relegated to the high-yield or junk pile. The important thing to realize is that at that point, many institutions can no longer invest in the security. Therefore it is important for companies that rely on this funding to maintain at least a BBB rating. What’s scary is that the number of issuers in the investment grade market ranked BBB has never been higher. 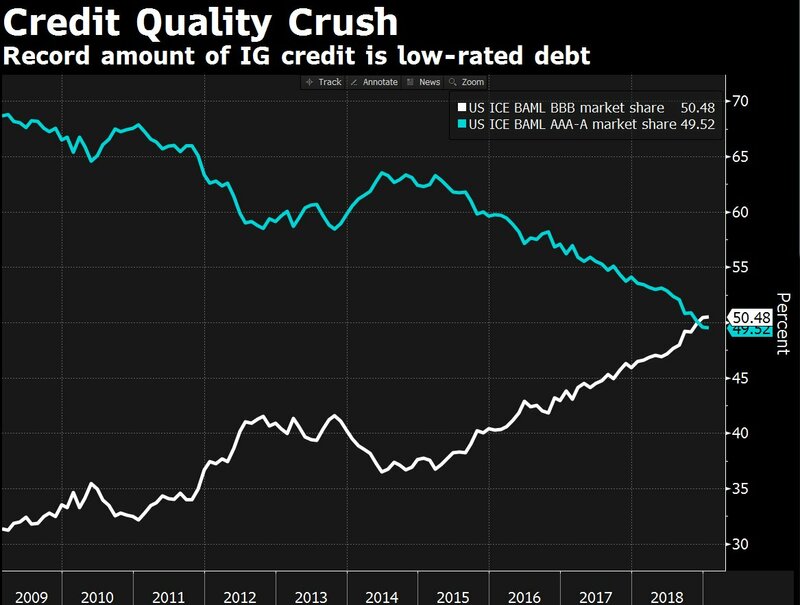 This means that the number of investment grade companies whose creditworthiness is one downtick away from junk is precariously perched ready to topple at the slightest weakness in the economy. Scary, huh? No wonder all the Bloomberg reporters have been highlighting it as a risk. It’s one of those inside baseball concerns that’s hard for the general public to get their minds wrapped around, but has professionals fretting. This could be good advice.